A bizarre puppet-animated version of The Goon Show that, surprisingly, coped fairly well in putting images to the surreal audio zaniness. String-and-rod puppets (designed by Ralph Young, the show's producer's father) combined to bring the famous characters to life - Eccles, Bluebottle, Neddie Seagoon, Brigadier Grytpype-Thynne, Major Denis Bloodnok, Henry Crun, Minnie Bannister and others - and traditional, simple cartoon animation and library footage was added to the mix to give the programmes a unique look. 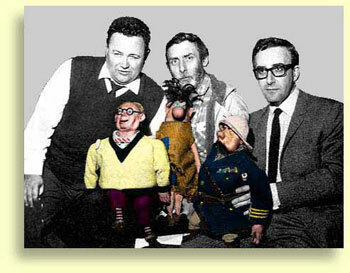 The puppets' characteristics were based on Spike Milligan's doodled impressions of how they might look, creating a somewhat grotesque but worthwhile visual interpretation, and the original team reassembled to record the voices. For the full story, why not go to the Telegoons website?